You can view your “text only number”. This number can not be changed. This is the field that contains each client’s phone number. You may have created a custom field specifically for mobile phone numbers so be sure to select the field that includes your client’s cell phone. Because Text Messages have a limit of 160 characters per message, Time To Pet will automatically split longer conversations into multiple messages. In order to conserve the number of text messages that are sent, you can set a maximum number of text messages each conversation will be split into. Images will be sent as a separate MMS or picture message. For example, if you included 3 images with a conversation, three separate picture messages will be sent. In order to conserve the number of text messages that are sent, you can set a maximum number of images sent per conversation. When Enabled, any messages sent to your clients In Time To Pet will be sent to clients via text message as well. If you would like text messages to be sent to clients, Enable this setting. You can adjust the default message delivery setting for individual Clients in the Client Numbers section. When Enabled, any messages sent to your staff In Time To Pet will be sent to staff via text message as well. If you would like text messages to be sent to staff, Enable this setting. You can adjust the default message delivery setting for individual staff in the Staff Numbers section. When Enabled, all Admins/Office Managers will be notified by text when a client requests new services. If you would like text messages to be sent to Admins/Office Managers when clients submit new service requests, Enable this setting. When Enabled, all Admins/Office Managers will be notified by text when a client submits a Service Change/Cancellation Request. 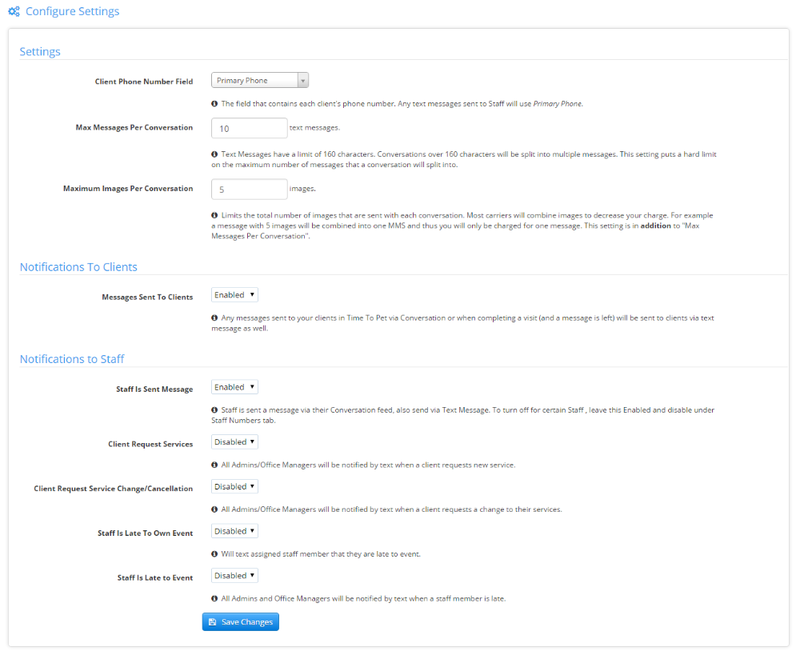 If you would like text messages to be sent to Admins/Office Managers when clients submit Service Change/Cancellation Requests, Enable this setting. When Enabled, staff members will be notified by text when they are late to their own event. If you would like text messages to be sent to staff when they are late to an event, Enable this setting. When Enabled, all Admins/Office Managers will be notified by text when a staff member is late to an event. If you would like text messages to be sent to Admins/Office Managers when a staff member is late to an event, Enable this setting.